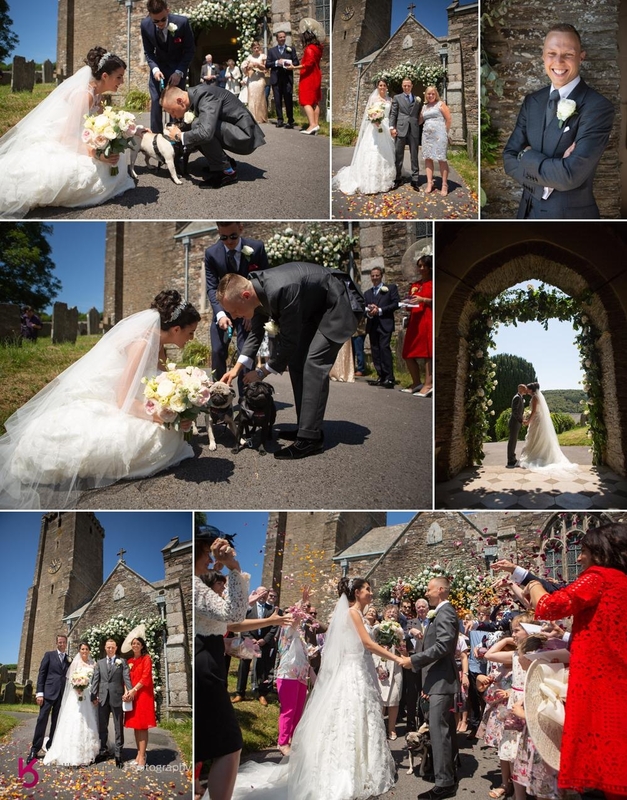 It seems like ages since Belinda and Josh came strolling up to me at a wedding fair in Plymouth to talk about their Thurlstone Hotel Wedding, but then I guess it was over two years ago now. We didn't seem to talk all that long before they went away with smiles on their faces. 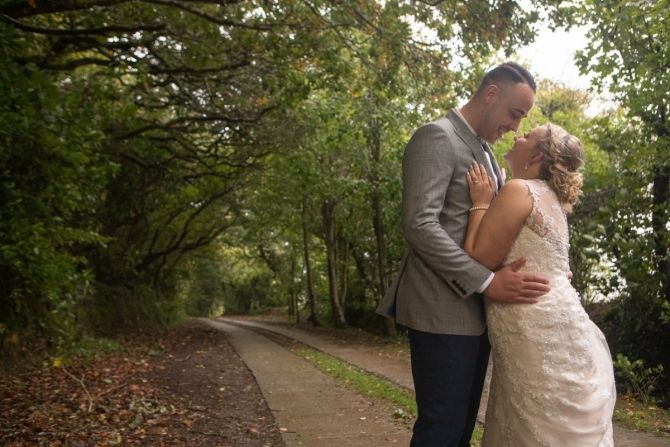 I'd never been to Thurlstone Hotel before let alone shot a wedding there, so I popped over the county boarder into south Devon for a venue visit and to have our final pre-wedding meeting with Belinda and Josh. 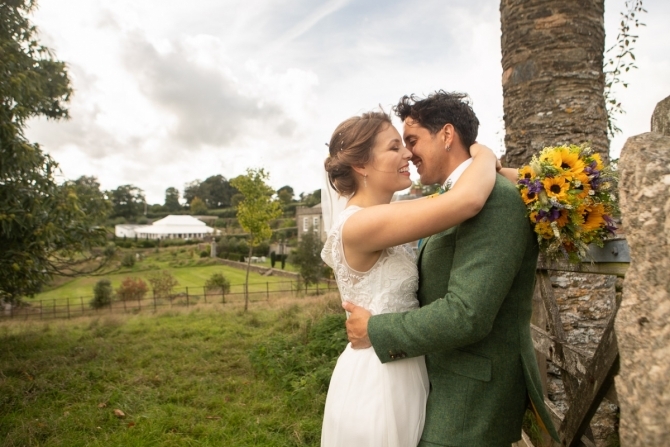 I knew it was going to be a cracking wedding when they told me the line-up of their suppliers, and they laughed because pretty much all their suppliers were reassuring them that they'd bagged themselves a really great photographer (This is where I blush). 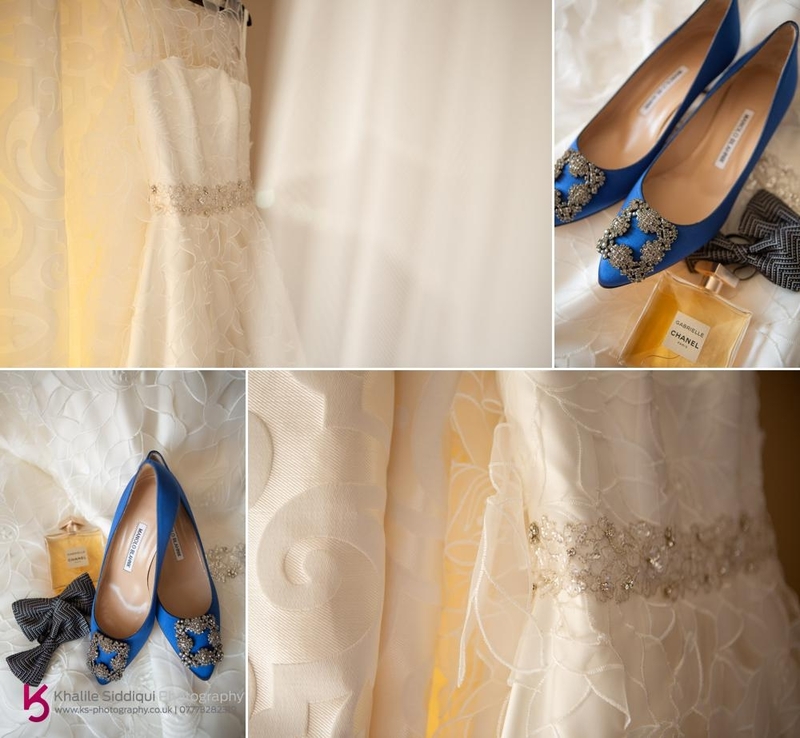 Belinda was wearing a pale ivory gown covered in a large floral lace design, she had it modified to add the jewelled and detailed lace waist band and chose a pair of Manolo Blahnik shoes as her something blue. 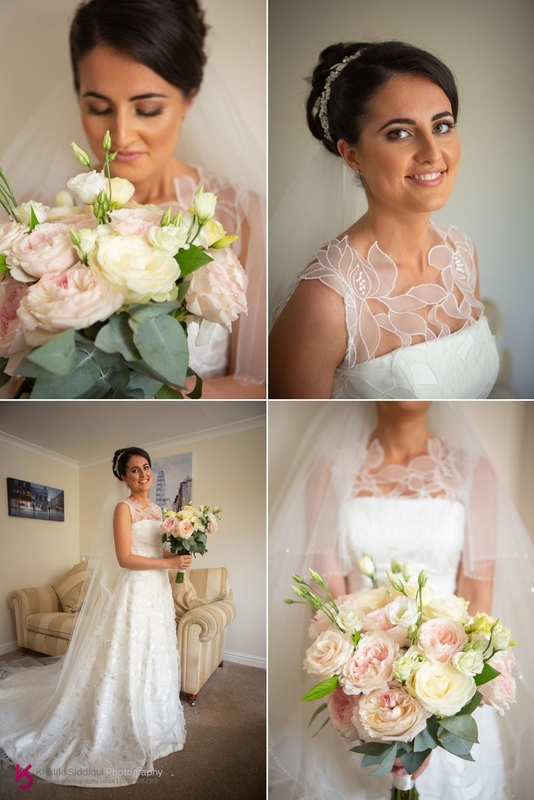 Belinda purchased her gown from Sam Cox in Plymouth, and accompanied the look with cream and soft pink roses, created by the lovely Phillip Taylor Corp who also did all the flower arrangements in the church and hotel. 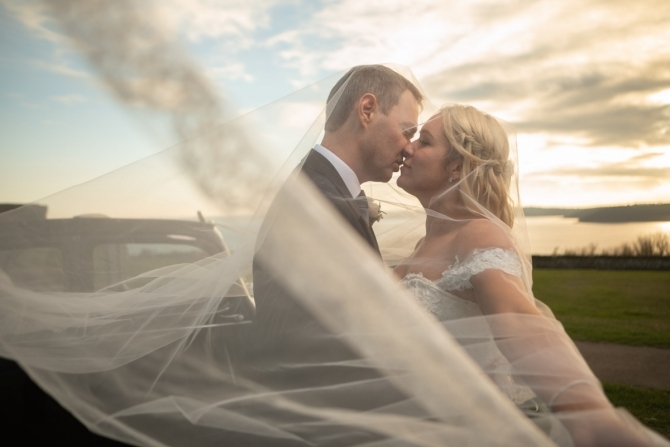 Belinda had a pair of white drop head Rolls Royce Phantoms which drove down from Birmingham to be there to transport her bridal party to Ermington Church. 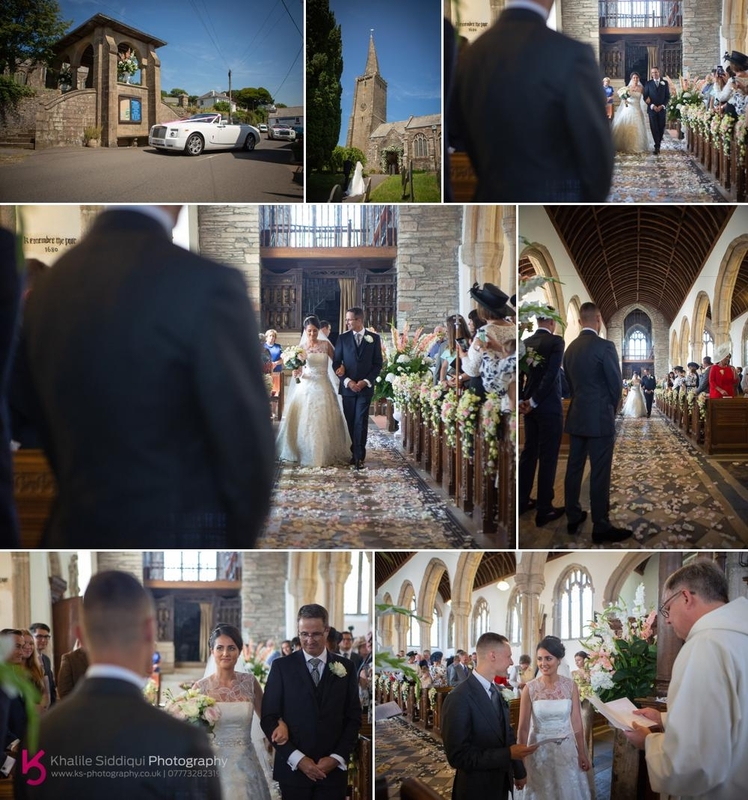 When we arrived at Ermington there really was a visual spectacle waiting for us and I'm not talking about Josh in his Tom Ford suit, although Josh you did look VERY dapper. No, it was the vast amounts of blooms, with three LARGE urns at the very large litch gate, petals all the way down the aisle and the wall of flowers waiting at the end where Belinda and Josh gave their vows. Belinda and Josh didn't really want a long ceremony, just wanting to get on with getting married and start the celebrations. 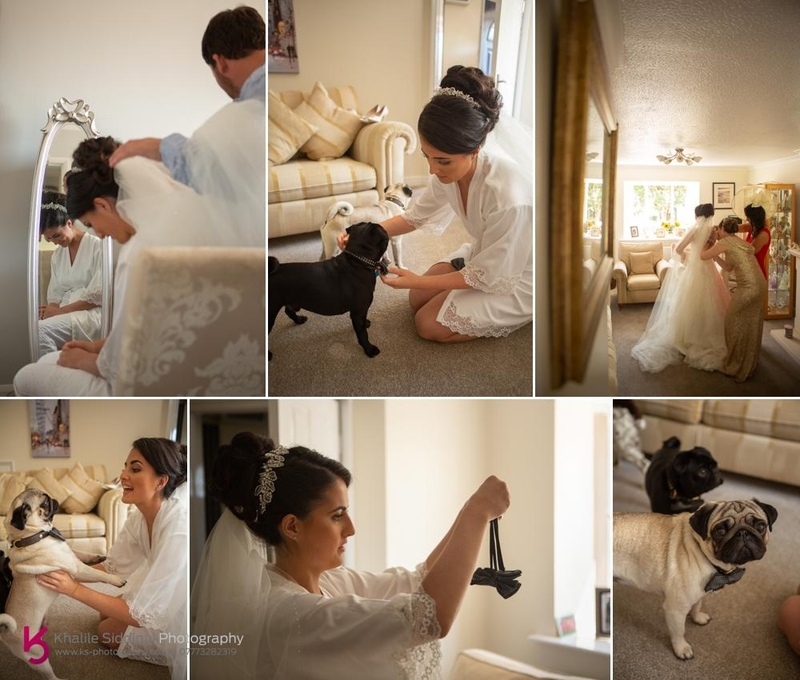 And when they came out of the church who were the first to congratulate them (besides myself and Tamsyn) none other than their beloved pugs, adorned in Tom Ford Bow Ties! 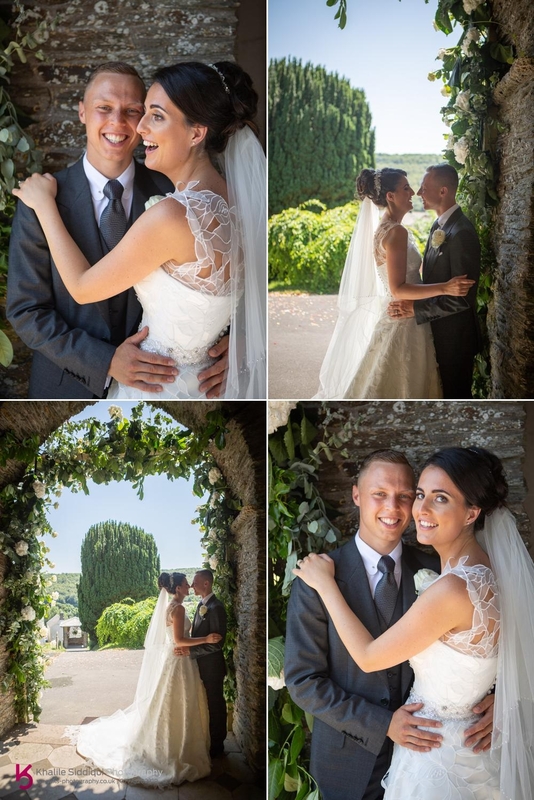 After having the confetti shot with the most beautiful (and plentiful) scented confetti, and group photos in front of the largest rose archway I've EVER seen, it was time to get some couple shots around the church grounds. Any couple who's booked us will know I always prefer to do the couple shots after the wedding breakfast due to the quality of light whenever possible, so I tried my best to get Belinda and Josh out of the harsh midday sun as much as I could and I just HAD to make the most of that impressive archway (well done Phillip). After utilising the cavernous porch-way I took the pair of them under the cover of a little tree with a cute bench in the shade. That said, when I did my reconnaissance of the church I did see a great vantage point up a hill for a couple of shots. 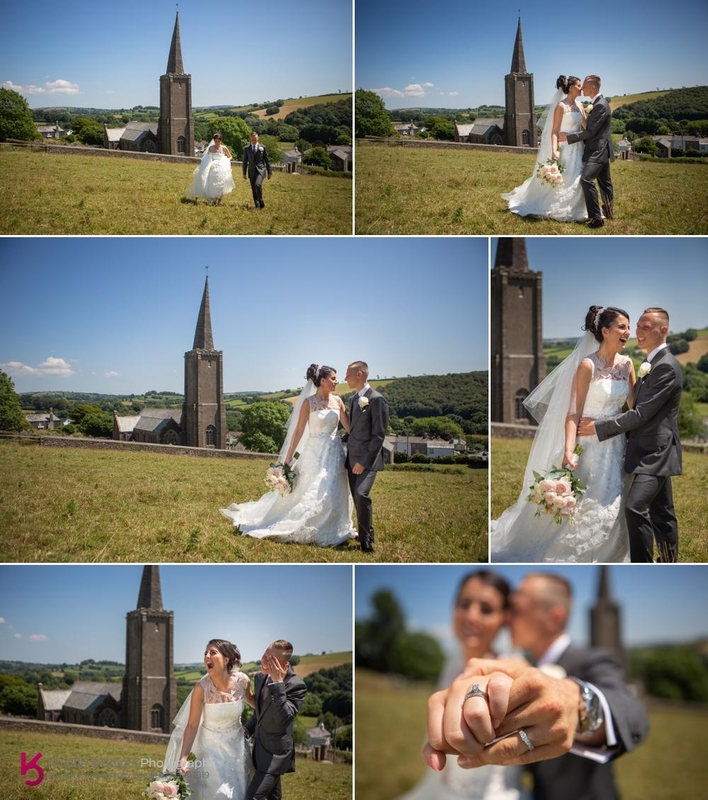 It was SUCH a hot day, probably the hottest day that I can remember shooting a wedding, there was little breeze so I didn't want to keep Belinda and Josh hanging around in the sun too long so we headed off to Thurlstone Hotel. On arrival there were even more blooms waiting to WOW the guest as they entered the beautiful restaurant. But it didn't stop there, there was also a five tier masterpiece of a cake created by the talented and awarded Edible Essence, and all finished off beautifully by the high end stationers of E.R. Stationary. 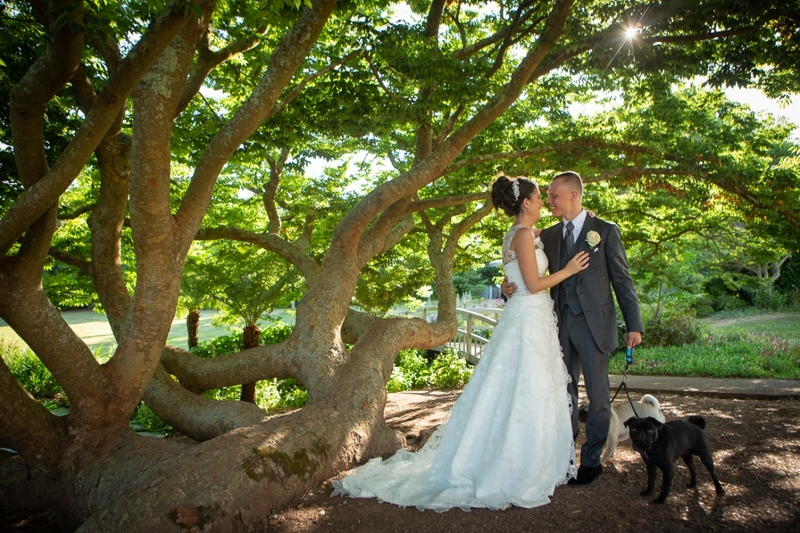 It hadn't cooled down much if at all by the time the wedding breakfast had finished, so again I took Belinda and Josh into the shade of this handsome old tree in the grounds of the hotel for a few photos with their beloved Pugs. After the wedding breakfast the guests made their way downstairs to the conference suit where there were casino tables waiting and the fabulous sounds of the much adored 'The Swing Kings' to entertain the guests into the evening. 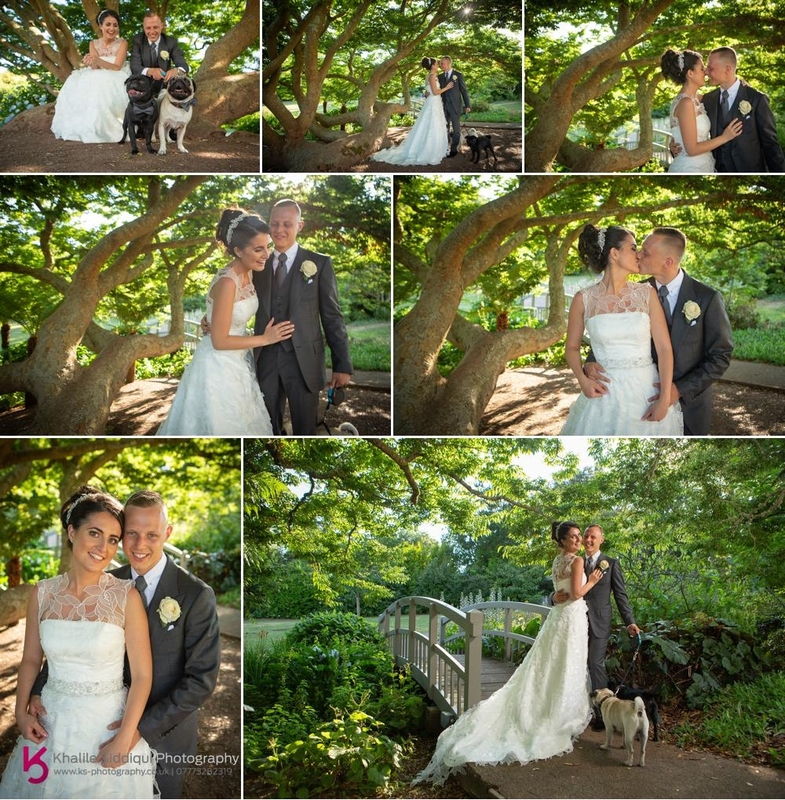 Dearest Belinda and Josh, thank you SO much for inviting us to be your photographers at your extravaganza of a wedding. It really will stick in my memory for many years to come! 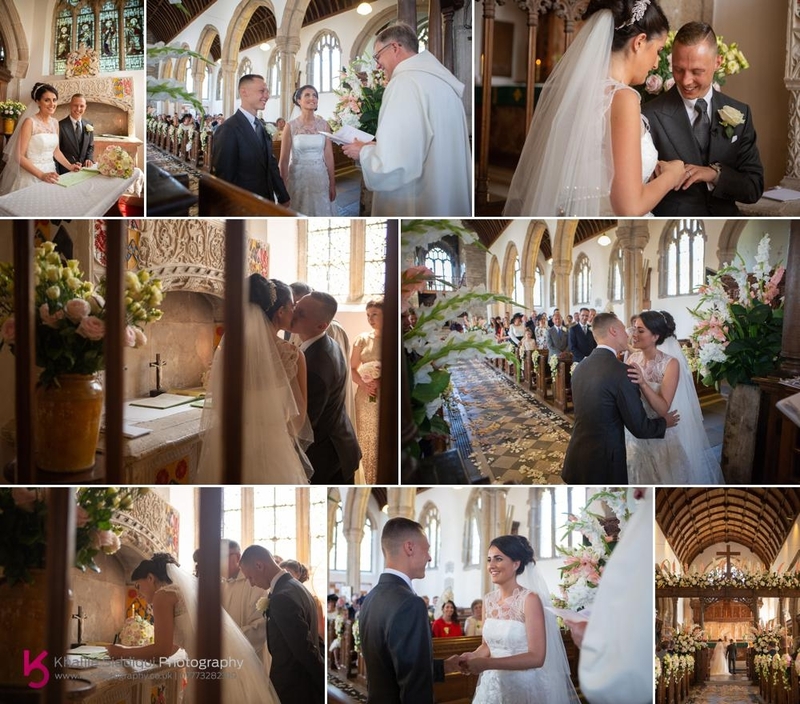 If you or someone you know are planning your own wedding, please check out the main weddings page on this website for some invaluable information you really aught to know about wedding photography, and please do make an enquiry as we shoot weddings home and abroad.